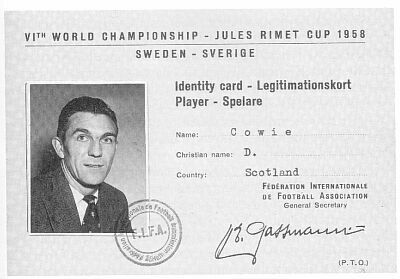 Doug Cowie was one of the greatest players ever to play for Dundee F.C. Some old timers will say he was the greatest. Picture if you can the year 1945, World War 2 just ended, men of Angus and its surroundings returning from an experience they’d never truly get over, my dad among them. Their craving for some return to normality centred on sport and the masses returned to Dens Park in search of inspiration and solace to ease their hurt. Perhaps a form of escapism, they found it in the building of a great team. High among the heroes of the years leading on from the war’s end was one Doug Cowie. Five years before I was born, the enigmatic, bowler hatted manager, George Anderson, looked north to the shipyards of Aberdeen in search of a star. A young apprentice riveter, sought after by many clubs, the smooth talking Mr. Anderson, later to sign the great God Billy Steele, persuaded the 16 year old, and his dad, that Dundee were the team for him. The kid downed tools and set out on a career that saw him star at Dens Park for 17 seasons and saw him run out for the dark blues no less than 341 times, many of them as team Captain. Sadly Doug Cowie was just before my time, and always I’ve regretted having missed seeing him and many other greats play. However, devious, scheming Dees that they were my older siblings taught me at the age of 3 years old, hospitalised in Edinburgh through serious illness, to recite the Dundee league cup winning team of 52. Apparently when I did so, once I reached the name Cowie they’d also taught me to lay special emphasis on that name, kinda like raising my voice in respect of a hallowed player. Must have sounded funny, but apparantly all the adults in the ward, which included two Hearts players of that time, so I've been told, would ask me to name the league cup winning team and wee show off that I must have been, I would comply like a dog doing tiricks. The Webster family were Cowie fans all and worshipped the ground he walked on. I can remember my dad, 3 brothers and sister speak about the man in god-like terms, especially my sister Margaret, who carried his photo in her handbag. Young though I was, I recognised here was someone special, something unique, and I used to love to ask her thousands of times to let me see the pic of Doug running down the slope from the player’s tunnel with a ball in his arms. It was cracked and torn with so much handling and she’d got it from my uncle Jocky Smith, a well known boxer in the Dundee area at that time and a pal of Doug’s. Funny how some things stick in the mind of a bairn and have a lasting effect. Some modernists would say it was a gentle form of brainwashing. Maybes aye, maybes no, all I know is it worked and dark blue blood has flowed proudly through my veins ever since. In his book "Dundee Greats" Jim Hendry described Doug as a player "with the touch of an angel." Such poetry to describe a player I find moving and inspiring. Because of such mental images provided by such talented writers, and my early recitation lessons I sometimes feel I did see him play, even though I did not. The facts are there for all to read for themselves. He began as a Centre Half but later became a Left Half, his favourite position and he was part of what many would say was Dundee’s greatest ever half back line of Tommy Gallacher, Doug Cowie and Alfie Boyd. He helped win two league cups in a row in the early 50’s, played in the Billy Steele days and was capped for his country 20 times. Some old timers say that the Dundee team of 48/49 was their best ever side, they lost the league by one point to Rangers, losing the last game of that season 4-1 to Falkirk. Even missed an early penalty in that one. Some things never change at Dens, the bullet in the foot syndrome evident even then. He also played in a Scottish Cup Final against Motherwell in 1953 which the Steelmen won 4-0 in front of a huge crowd at Hampden of wait for it, this is no typo error, 136,990. He also featured in the infamous Dens Park massacre of United by 7-3 in 1956, the famous Scobie game. Near the end of his playing days in 1961 Doug still lived in a Dundee tenement. Changed days indeed from now. But one must remember football then was a working man’s sport and they were a different breed of player in those days. No agents, no fancy hair styles, no perms or after shave, no fancy cars or lucrative wages. Some came up in the lifts from the mines of Fife to make it in time for their professional sides. They played with a pride in their team that would put most modern players to shame, and the elements rarely caused a match to be cancelled or anything other than a serious injury cause them to miss a game. And they played with boots that covered their ankles, kicking and heading a ball that grew heavy if it rained, with a lace that hurt the head if by chance it met the napper straight on. In a rare moment of bliss I once met Doug at a kids match at Graham Street. There was no one else near us on the line and I had a chance to chat to one who had played such a big part in my early years, though he didn’t know it, and at the age of 3, I hadn’t understood fully either. I stared at the man who had been part of my recitations all those years ago and felt we were perhaps fated to meet. Most of us today would say Doug was in the wrong place at the wrong time. He didn't make a lot of money from his great days in football. Not enough to buy a pub at the end of it, at any rate. He told me as much. Then, true gentleman that he is, he went on to say he never regretted a thing, would never want to change a single thing, loved his days at Dens, and had so many fond memories that he owed to Dundee Football Club. This quiet spoken, extremely modest legend certainly touched me that day. Yet I remember thinking so few at Graham Street knew who he was, kids playing a Sunday Boys game, their managers, all oblivious to the legend who was standing on that touchline. If he’d played for the Old Firm he’d have been an everyday hero. Dundee heroes, and United ones, too, like old soldiers, are sometimes allowed, unfairly, to fade away. Sadly, there is some confusion surrounding his final departure from Dens. Dundee refused to allow the 31 year old to train with the first team players and he was given a free transfer to Morton. I remember the rage of my dad at that time, remember his swearing and utterances of that day. My mum told him to calm down, "it’s just a gemme." Though he still ensured I became a Dee and took me to many Dundee games to make sure of that, my dad seemed to lose his outward love of the club after that event. Doug Cowie to him was not a player to be dealt such a sad hand at poker. But to his credit, Doug never held a grudge against the side he had captained and played for with a pride that is so rare in these modern times. No player played longer for Dundee than Doug in the history of the club. Yet he never got a testimonial match for the team he’d served so proudly. I often wondered when they called a lounge at Dens Park after the great man they couldn’t have had a belated tribute for him as well, but some might think I’m being silly now. I don’t. I still think his legendary status would have ensured a decent crowd. When Dundee released him in 1961 Doug Cowie went on to play for Morton, had a brief spell as Manager at Raith Rovers, then returned to Morton as a coach. He had a brief coaching spell at Dundee United before becoming a talent scout for the Arabs as well. He and another scout, Davie Small, became the chief scouts at Tannadice, and it was in this connection I knew them both. True gentleman, they were different from most scouts, even many today, who would watch a kid for a few minutes then disappear. This pair took the job seriously and discovered many of the young promising players that would go on to make United great in their halcyon days. In a sense both Dundee teams should honour the man. Still resident in the Dundee area Doug will be long remembered. And so he should be. Must be around 74 now, but surely age, like a vintage wine, should add to the endearment of a worshipping fan base. If being the longest serving Dundee player in the history of the club isn’t enough……if being in two league cup winning teams isn’t enough…..if playing in a side that came within one point of winning the league in 1949 isn’t enough…..if playing in a losing Cup Final in front of a crowd close to 140,000 isn’t enough…..if gaining 20 full caps, 5 League caps, one B international cap isn’t enough……..if playing alongside some names from the past like Bobby Flavell, Pud Hill, Tommy Gallacher, Alfie Boyd, Bill Brown, Danny Malloy, and Billy Steele isn’t enough…… to convince you that here was a special talent, legendary in his own right, you’re a hard guy or gal to please. Whether you saw him play or, like me, did not, we should worship the name of an Aberdonian who played with pride for the cause, and should go down in the history books of Dundee F.C. as one of the greatest players ever to don the great dark blue. Doug Cowie, I salute you after all these years. YOU WERE THE GREATEST. And I'm glad, all those years ago, I said your name the loudest. Jim Hendrie’s "Dundee Legends" Book - inspiring, to say the least. And finally to Doug himself, for honouring Dundee F.C. by his presence and making a wee lad so happy, even though he didn’t understand at the time – he does now. Glad to hear he's seen the article. Hope I didn't get too many facts wrong, Doug. This article can be updated at any time by me. Please, if you've got dads or grandads who can add wee stories about Doug, don't hesitate to get in touch. email address denspark156@btopenworld.com Any anecdotes, no matter how silly you might think they are could be important.